When our Sr. Mary Cecilia received the habit we posted a picture of her along with Sr. Mary Amata and Sr. Diana. 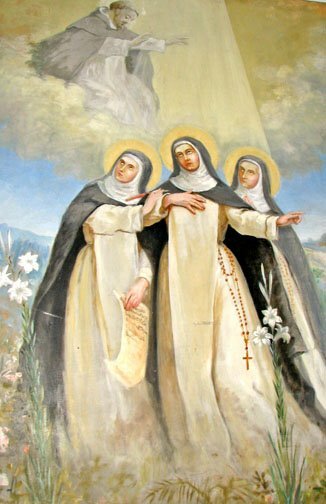 All three are named after the Holy Trio of early Dominican Nuns--Blessed Cecilia, Bl. Diana and Bl. Amata. You can read something about them in a past post HERE. It is from Bl. Cecilia that we have an accurate portrait of what our Father, St. Dominic looked like. For centuries the Brethren poo-pooed it as the musings of an old woman but in 1943 at the time of the removal of the casket from the ornate tomb in Bologna, professors from the University of Bolgna x-rayed the casket and made some interesting observations regarding St. Dominic's height (5ft. 5 3/4 in. ), build, figure, etc. Wouldn't you know, Bl. Cecilia's memory was QUITE accurate! 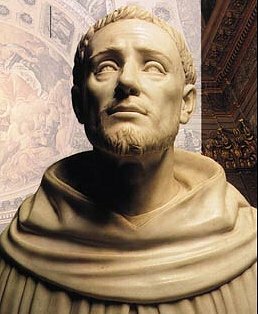 Based on these studies a "true effigy" of St. Dominic was created and this bust is in the sanctuary at the Basilica in Bologna where St. Dominic is buried. Here is Bl. Cecilia's description. The charm of it is not lost eight centuries later. "This was St Dominic's appearance. He was of middle height and slender figure, of handsome and somewhat ruddy countenance, his hair and beard of auburn, and with lustrous eyes. From out his forehead and between his eye brows a radiant light shone forth, which drew everyone to revere and love him. He was always joyous and cheerful, except when moved to compassion at anyone's sorrows. His hands were beautiful and tapering; his voice was clear, noble, and musical; he was never bald, but kept his religious tonsure entire, mingled here and there with a few grey hairs."